If one is to willingly lose his name, stops recognizing one’s own face, completely disregards one’s body – then what would remain? For some, nothing, as they will simply cease to exist and perish into oblivion and forgotten realms. 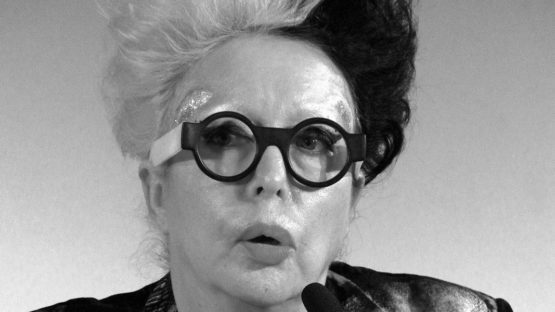 Orlan, a French contemporary artist, did all those things, yet she didn’t disappear. Instead, she has gone and still is going through a process of rebirth, embarking on a quest of finding her true identity and exposing the shallowness of today’s human race and their emphasis on something relatively meaningless: the beauty. Working for nearly half a century, Orlan’s actions call into question whether our self-representations conform to an inner reality or whether they are actually carefully contrived falsehoods fabricated for marketing purposes – in the media or in society at large. Born Mireille Suzanne Francette Porte in Saint-Étienne, Loire, she adopted Orlan (which she always writes in in majuscule because ORLAN doesn’t want to fit into the lines or the ranks) in 1971. Not much is known about her, a fact that perfectly aligns with the notion of constant rebirth and reinventing self. Like so many artists of her generation, she was also influenced by Duchamp. However, her personal response was an extreme one, considering her own body a readymade. Orlan came into contact with Fluxus through Ben Vautier and his famous gallery in Nice. Upon baptizing herself Saint Orlan in 1971, she festooned her body with billowing draperies made of black vinyl or white leatherette, exhibiting these amazing sculptural costumes a year later in Milan. Her performance story began in 1964, when she began the Slow motion walks (Marches au ralenti), walking as slowly as she possibly could between two central parts of her hometown Saint-Étienne. A year later, she used her own body as a measuring instrument in MesuRages. For this performance, she measured how many people could fit within a given architectural space, using her “Orlan-body” as a unit of measurement. For the first time, she made great use of the sheets of her Trousseau, which is a set of household goods and other items traditionally provided to a young woman by her family upon her marriage. In several later pieces, the artist re-purposed these sheets. Vintages, a series of photographic artworks were made between 1964 and 1966, but Orlan destroyed the original negatives, and all that has remained is one copy of each photograph. In this series, she posed naked in various yoga-like positions. In 1977, Orlan’s performance The Artist’s Kiss became a scandal. During the FIAC in Paris, just outside the Grand Palais, a life-size photo of her torso was turned into a slot machine. A spectator would insert a coin and could see it descending to the groin before being awarded a kiss from the artist herself. Known primarily for her innovative performances, Orlan is actually an immensely talented artist, working in sculpture, photography, and video. Applying the same working method as in her performance work, she uses scientific and medical techniques like surgery and biogenetic. Those are only mediums for her since the idea prevails and the materiality pursues. From 1994 onwards, the artist has been engaged in making digital photographic series titled Self-Hybridizations, merging her face with past facial representations (paintings, sculptures, masks) of various non-western civilizations. After working on Pre-Columbian (1998), African (2000-2003), and American-Indian (2005-2008), in 2014 Orlan completed Peking Opera Facial Designs. She also orchestrated a series of film posters Le plan du Film in 2001, with numerous writers and artists. Each poster affirms the existence of a film that doesn’t actually exists but carries a deeper meaning, questioning the notions of character and narrative reflected in the social reality of individual roles and stories. The Harlequin’s Coat (2007) is a result of Orlan’s collaboration with the SymbioticA laboratory in Australia. In Shifting Folds (2012), Orlan’s most recent sculptural work, the artist combined sculpture with photography. In order to create these computer-made works, Orlan embraced a vast network of cultural references and reconfigured the way Folds define and form the body within the context of the history of the field – from the Folds of the Body to the Fold without the Body. The origins of her video work go back in 1978. As she was preparing to speak at a symposium on video and performance art, her health suddenly deteriorated and she had to be taken to hospital for emergency surgery. “I almost died because I had an ectopic pregnancy. They had to operate to save my life and remove what they told me was a non-viable fetus.” She took a video crew along to film the operation and insisted that she must remain conscious throughout the procedure. What she captured on video that day, almost forty years ago, greatly inspired and focused her career in a rather specific direction. Having always questioned the status of the body within the society and the political, social, and religious pressures that are pressured in the flesh, Orlan received a nudge (in the form of the emergency surgery) and began exploring the possibilities of this new medium – her flesh. In 1990, on her 43rd birthday, she had the first of the operation-performances that completely altered her face. There were nine total surgeries from 1990 to 1993, and they were part of her project The Reincarnation of Saint-Orlan. In her striving to represent an ideal formulated by male desire, it is important to state that she does not seek to improve or rejuvenate her original appearance but to use her own flesh as a medium of transformation. All of the surgeries were carefully thought off, captured in video, and broadcasted in various institutions around the world, for example, the Sandra Gehring Gallery in New York and the Centre Georges Pompidou in Paris. The Reincarnation of Saint-Orlan began when she created a composite image, via morphing computer software, of her own face, combined with that of Leonardo’s Mona Lisa, an anonymous School of Fontainebleau sculpture of Diana, Gustave Moreau’s Europa, Botticelli’s Venus, and François Pascal Simon Gérard’s Psyche – all of them were chosen not for the canons of beauty they represent, but rather on account of the stories associated with them. Orlan’s performances, sculptures, and video will be forever etched in the history of art. Best known for her surgery-performances, she was frequently asked if the true goal behind them was the process of her beautification. She firmly holds the ground, stating it was never her intention to become more beautiful, but rather to challenge and confront the world’s thoughts of and expectations of conventional beauty. Without being certain that she can change those entrenched viewpoints, the artist still produces images that are very different from those usually found in magazines, TV shows, comics, and video games. By doing so, she’s made a powerful statement of the existence of other ways to think about one’s body and one’s beauty. Orlan lives and works between Paris, Los Angeles, and New York.